Kraftwerk are pop's original robot overlords, their belief in the supremacy of machines once extending to sending four lookalike androids on tour in their place. "Nowadays the group's clock-work doppelgängers have to make do with a brief cameo at the encore, during which they bop in slow motion. It's a novel sight – but one laced with humour too. How absurd to be at a "live" music performance watching four animatronic dummies gyrating with mechanical melancholy. " The other great irony is that a band who once represented music's future are nowadays essentially a retro act. 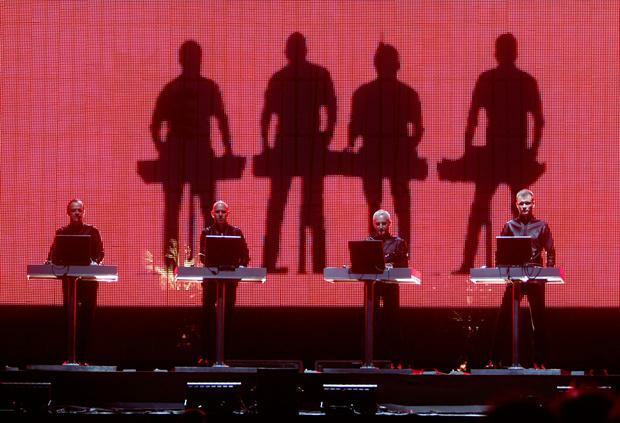 Kraftwerk haven't released a new album in over a decade and the first of two sold out night at BGE Theatre was dominated by tracks from the Dusseldorf quartet's Seventies golden period, when they influenced artists such as David Bowie and Joy Division. With Ralf Hütter the only original member still squeezing into his trade-mark Tron-like bodysuit, their nostalgia chips were at full capacity for their first Irish performance in four years. As impressive 3D graphics glimmered overhead – special glasses were handed out on entry – they proceeded with machine-tooled precision through classics such as The Man Machine, Neon Lights and Tour de France (the cycling-obsessed Hutter's valentine to all things on two wheels). Here and there, the material had been rebooted. Radioactivity featured a verse sung in Japanese by the frowning Hütter, a nod towards the stricken Fukushima nuclear plant. And the visuals accompanying Space Lab underscored the Dadaist playfulness that has always twinkled just beneath the surface, with a flying saucer drifting down the Liffey and landing outside the BGE Theatre. But familiarity bred only exuberance among the audience. These are classic electro-pop anthems and Kraftwerk delivered them with the perfect mix of Teutonic severity and dark wit. Long may their circuits continue to sizzle.